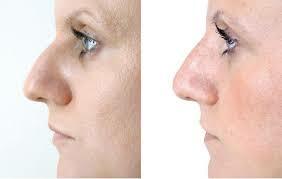 The nose is a trademark feature of one’s face and perhaps the most noticeable aspect of one’s appearance. Its various flaws can be more conspicuous than those of other facial components. For this reason, rhinoplasty is one of the most common plastic surgery procedures performed today, but not everyone is ready to commit to a permanent surgical procedure like rhinoplasty. For those looking to subtly refine the shape of their nose, Dermedix Clinic offers safe, effective, non-surgical rhinoplasty solutions. The non-surgical Rhinoplasty, or non-surgical nose job as it is most commonly called, is a revolutionary non-invasive cosmetic procedure that allows the nose to be reshaped without surgery. Through the use of injectable filler, the nose can be injected to straighten a nasal profile, lift a droopy tip, create a nose bridge, or smooth out a visible bump. These dermal fillers each have benefits that work well for a non-surgical nose job. They are created with Hyaluronic Acid and generally last approximately 1 year in the nose. Because of the temporary nature of an injectable filler, a non-surgical nose job will have to be maintained approximately every 9 months to a year, depending on how fast your body metabolizes the product. After being injected, patients are pleased to discover they can resume their normal activities immediately. The results are also visible right away, which gives instant gratification. Although there may be minor swelling due to the injections, the majority of this swelling will subside within the first 24 hours. Patients typically find the non-surgical nose job to be an easy, quick, and exciting process that results in an aesthetically beautiful and pleasing appearance. Non-surgical nose job (Rhinoplasty) involves a non invasive technique that reshapes the nose by employing an injectable filler to get the desired result. Going under the knife is a big deal, and many people worry about the look after surgery. A non-surgical nose job allows you to have the nose you always wanted, without having to undergo an invasive procedure. For patients who seek to correct mild imperfections in the aesthetic appearance of their nose, non-surgical rhinoplasty is rapidly becoming a popular alternative to surgery. 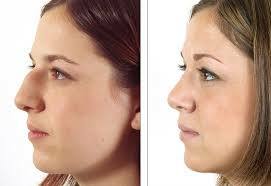 The non-surgical nose job cannot make a larger nose appear smaller or improve breathing, so it may not be for everyone. Some patients will need to consider a primary rhinoplasty as a treatment option for their desired changes. The non-surgical nose job can, however, correct imperfections on the nose, making it more balanced and symmetric with the rest of the face. This restores facial harmony and can result in a very pleasing, natural appearance. What should I expect with a Non-surgical Nose Job injection? In recent years, significant advancements have been made with dermal fillers. For the most part, injectable fillers now contain a freezing agent mixed into the actual injectable filler product. The freezing agent works to numb the region being injected so that the patient usually does not feel any pain. That means increased comfort and ease for patients who want a non-surgical rhinoplasty. How long does a Non-surgical Nose Job take? Patients are always happy to discover that the entire treatment can be successfully accomplished in less than 15 minutes! Dermal filler treatments can be performed quickly and easily, and the outcome of a non-surgical nose job is instantly gratifying! Who is a candidate for a Non-surgical Nose Job? Not everyone is a candidate for a non-surgical nose job. Patients who wish to have significant reduction in an aspect of their nose, or who need internal structural correction are best served by a traditional rhinoplasty procedure. Candidates for non-surgical rhinoplasty could include those who aren’t yet ready to undergo permanent surgery, those who are uncertain what change they’re looking for in their nose, those who are not eligible for surgery and more. What is the recovery time following a nose injection? 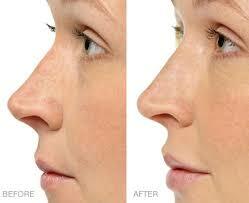 The recovery following a non-surgical rhinoplasty is quite simple. Patients usually find that they can return to their normally scheduled activities right away. They might experience the most swelling for up to 1 to 2 days following. It is not unusual for slight swelling to remain for 7 to 10 days afterwards, but it is usually very minimal. How long do the Non-surgical Nose Job results last for? Non-surgical nose job results typically will last up to 1 year. For non-surgical rhinoplasty, we advise that clients return for maintenance before the 1-year mark in order to maintain the overall look, contour, and shape created for the nose with the dermal filler.